Be it shared IP infrastructure, multi-tier application environments, infrastructure virtualization, or hybrid cloud, the pieces that constitute modern day application environments are growing increasingly complex. And with good reason – today’s users expect instantaneous accessibility at all times. 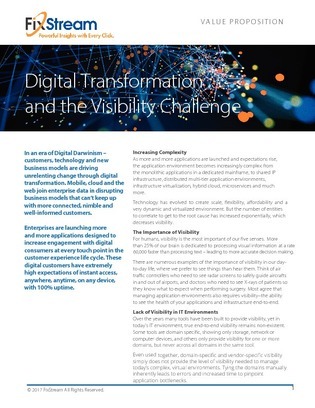 As enterprises update their infrastructure and systems become more intricate, IT operations will start to struggle with one issue – visibility. Good visibility into infrastructure can help IT teams quickly identify and address problems as they arise, drastically saving time and reducing costs. Learn more about how one solution can give your IT operation the visibility and correlation tools to maximize efficiency, monitor performance, and gain more value from your enterprise’s infrastructure.